Hop into Easter with a bundle of gifts that are anything but typical. Trade the traditional Easter basket of candy for these affordable new goodies from Prime Time Toys! Now that the weather is finally warming up, you can't go wrong with outdoor toys! At these prices you can affordable family fun outside this spring and summer. Whether you pick up a couple of Super Storms for family battles or the 6 pack of Hydro Storms, you will have hours of fun this summer! 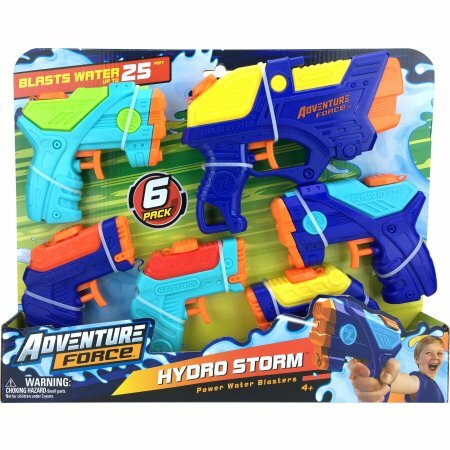 Hydro Storm 6-Pack – Pack the Easter basket with some fun, outdoor toys that will be sure to keep kids active as the weather gets warmer. These compact water blasters offer a great value and high performance for any water battle. The Hydro Storm is the ULTIMATE VALUE PACK! Double the fun with the Hydro Storm blaster set. This bundle includes SIX water blasters. The compact squirt guns, featuring quick action and easy refill, project water up to 25 feet. Adventure Force is a trademark of Wal-Mart Stores, Inc. All Rights Reserved. 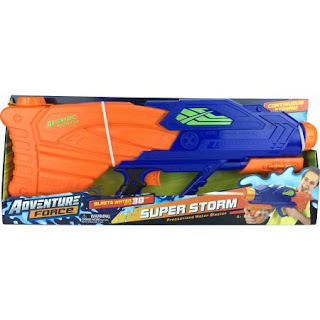 Super Storm – There will be no competition this Spring/Summer when kids get the new Adventure Force Super Storm water blaster in their Easter basket featuring a 68-ounce water tank. Getting the upperhand in competition has never been easier with the Super Storm water blaster. For the longest lasting continual play, the Super Storm features a 68-ounce size tank and pressurized water blaster action that will send water soaring up to 38 feet! The Super Storm blaster nozzle has three adjustable power blast nozzles – Super Soak Blast, Long-Range Blast, and Quad-Stream Blast with four Water Streams. Use the pump conveniently located on the front end of the water blaster to build pressure for the ultimate wet down! Then, press the trigger to blast a continuous stream of water. Why not ditch the sweets this year and get your kids something they will have fun with. Pair these water guns with a jump rope, bubbles, sidewalk chalk and make a basket of nothing but outside fun!